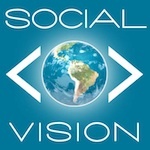 Social Vision Marketing / Pinterest / Is Pinterest Right For Your Business? Pinterest is an awesome social media site for sharing interesting photos, ideas, and projects. Many businesses have found it to be a great source of traffic for their brands’ websites, but how do you know if it’s right for your business? Can you stay active on Pinterest? Do you have visually interesting photos? Do you have more to share than just what you do? If you answered ‘No’ to any of these key questions you should really reconsider joining Pinterest. Chances are it will just end up as another dead account out there in cyberland.